Selecting a cheeseboard for a group of friends is one of my favourite foodie things. You have to match the cheese to both the folks and the occasion, and of course for us in Wellington, you are limited by the cheeses available. And whilst I love ‘extending’ my palate and those of my erstwhile companions, I also know that some palates are more pedestrian than others. On nights like these I employ the balanced strategy to my cheese board – where I make sure I have one guaranteed crowd-pleaser to balance out an other potentially more difficult cheese. At times it has been a trusty, raw milk Brie de Meaux from Le Marche Francais, but lately I have been employing the services of the dependable Comté. The safe cheese then lets me wander into uncharted territories with my other choice. This week it was an untried Spanish blue, last week it was a very ripe Banon. But I was safe in the knowledge, that no matter how stinky, sharp or down-right inedible my risky cheese turned out to be, Comté’s warm sweetness would delight even the most fearful of chees-o-phobes. And Comté didn’t let me down. I can see why it is the most popular cheese in France. You can melt it, snack on it, grate it, add it to a fondue and eat it in a sandwich. 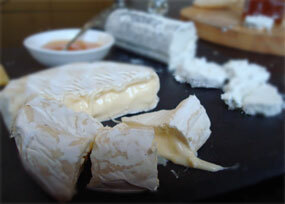 And, it is great on a cheese board, bringing an easy, accessible yet sophisticated charm. Comté is an AOC French mountain cheese from Jura mountains. It is made from the unpasturised summer milk of grass-fed Montbeliarde cows. By regulation each cow must have at least one hectare of grazing and these herbs, wild flowers, and sweet young grasses gives Comté its beautiful sweet, nutty taste of summer. It has a smooth, supple but relatively hard pate, and a dusty, brown rind, the result of the affineur’s careful 4-18 months of salting, turning and rubbing with brine – AOC rules specify salt can only be added externally. For me, the cheesemaker has captured the sun’s golden rays in Comté, bringing back high summer memories of lying in the grass warm and safe and happy. Who could not love that on a plate!